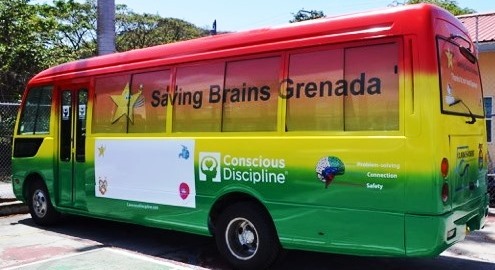 The Saving Brains project has secured further funding to support their resource bus throughout various communities in 2019. The Corporal Punishment Prevention programme which ended in 2016, provided parents with alternative parenting skills using Conscious Discipline to offer parents an alternative to harsh methods of punishment which is not conducive to a child’s cognitive development. Through the project over 60 roving caregivers received training and can impart their knowledge through the community using the Saving Brains resource bus. Barbara Landon, a bioethics lecturer at St George’s University School of Medicine (SGU), since 2009 has dedicated her efforts to teaching Conscious Discipline in Grenada and in the Caribbean. She has worked with UNICEF, the Conscious Discipline Foundation, Roving Caregivers, Ministries of Education and Social Development and NGOs. She is particularly pleased that the programme will be introduced in 2019 to the pre-primary schools. The Saving Brains project addresses statistics that 250 million children in the world will not reach their fullest potential because of the lack of proper neurological development. It is said violence negatively impacts healthy brain development during the first 1,000 days of a child’s life and well into their adulthood, therefore, the programme is tailored to alter adult perceptions of child behaviour and child rearing that will enable proper neurological development.